These durable modular front speakers crank out quality sound and bass response while being able to endure harsh conditions thanks to their marine-grade fiberglass construction. They are compatible with our Overhead Audio System or most other audio systems. Set includes stainless-steel mounting hardware. The Powered Subwoofer is designed to deliver heart-pounding bass response. It features a modular design, simple, plug-in installation, fiberglass construction, and marine-grade components to withstand harsh trail conditions. 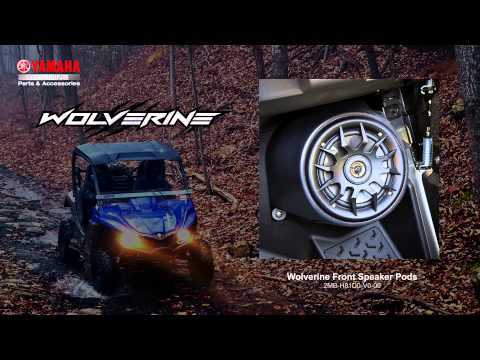 Yamaha and SSV Works® have collaborated again to create the 3rd generation Overhead Audio System for all Viking VI, Viking, and Wolverine models. This upgraded system takes SSV’s highly successful Overhead Audio System and adds next level performance and features! Designed to withstand harsh conditions while working on the farm or ripping down the trail, this system preserves valuable cargo space by mounting overhead.